بافت قلب محیطی تحریک پذیر است. یکی از روش های توصیف انتشار پتانسیل عمل در بافت قلب، استفاده از مدل اتوماتای سلولیست. 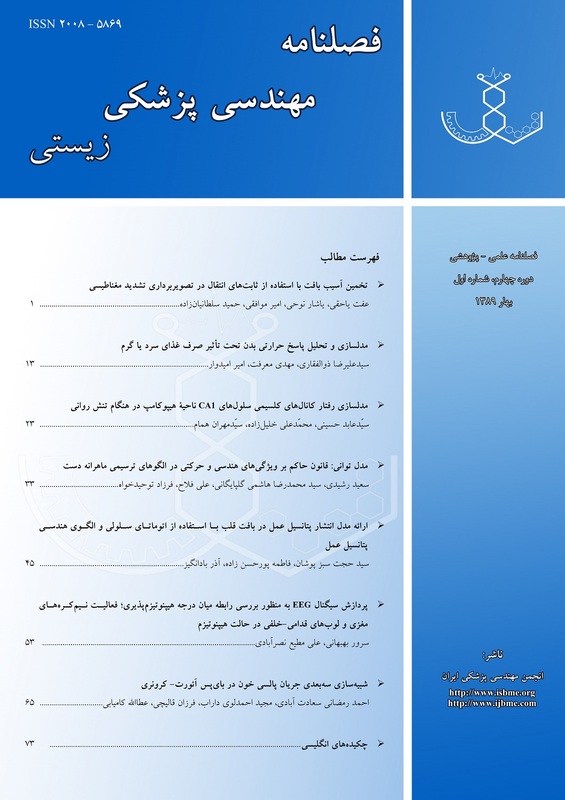 سرعت اجرای مدل های مبتنی بر اتوماتای سلولی در شبیه سازی های مقیاس بزرگ، یکی از مزایای آن نسبت به روش های مبتنی بر معادلات دیفرانسیل است. مدل های قبلی مبتنی بر اتوماتای سلولی، قادر به حذف لبه های مسطح ایجاد شده در الگوهای حاصل نیستند و یا همسایگی های بزرگی دارند. به علاوه در مدل های قبلی تلاشی برای تطبیق الگوی هندسی پتانسیل عمل بطنی با پتانسیل عمل واقعی نشده است. در این مقاله مدلی ارائه شده است که با حداقل همسایگی، از تولید لبه های مسطح جلوگیری می کند. همچنین با تقریب خطی از مدل الکتروفیزیولوژیکی معروف، الگوی هندسی پتانسیل عمل نیز در مدل برآورد می شود. The heart tissue is an excitable media. Cellular Automata is an approach describing cardiac action potential propagation. One of the advantages of Cellular Automata approach over the differential equations based models is its high speed in large scale simulations. Prior Cellular Automata models are not able to eliminate flat edges in the simulated patterns or have large neighborhoods. Moreover, they are not able to match the shape of ventricular action potential to the real ones. In this paper, we present a new model which prevents flat edges creation by using minimum number of neighbors. we also rather preserve the real shape of action potential by using linear curve fitting of a well known electrophysiological model. Barbosa C. R. H., Simulation of a plane wavefront propagating in cardiac tissue using a cellular automata model, Phys. Med. Biol., 2003; 48: 4151–4164. Moe K. M., Werner C.R., Abildson J.A., Utica N.Y., A computer model of atrial fibrillation, American Heart Journal, 1964; 67: 200-220. پورحسن‌زاده فاطمه، مدل اتوماتای سلولی انتشار پتانسیل عمل در عضله قلب، پایان‌نامه کارشناسی ارشد، دانشکده مهندسی برق، گروه مهندسی پزشکی، دانشگاه علم و صنعت ایران، اردیبهشت 89. Gerhardt M., Schuster H., Tyson J. J., A cellular automation model of excitable media including curvature and dispersion, Science, 1990; 247: 1563- 1566. Markus M., Hess B., Isotropic cellular automaton for modeling excitable media, Nature, 1990; 347: 56-58. Weimar J. R., Tyson J. J., Watson L. T., Diffusion and wave propagation in cellular automaton models of excitable media, Physica D, 1992; 55: 309-327. Weimar J. R., Tyson J. J., Watson L. T., Third generation Cellular Automaton for Modeling Excitable Media, Physica D, 1992; 55: 328-339. Costa Monteiro E., Miranda L. C., Bruno A. C., and Costa Ribeiro P., A Cellular Automaton Computer model for the study of magnetic detection of cardiac tissue activation during artial flutter, IEEE transaction on magnetics, Sep. 1998; 34 (5): 3451-3454. Rennard J. P., Introduction to cellular automata, 2000, available at: http://www.rennard.org/alife. Pilkington T. C., Loftis B., High performance computing in Biomedical research, Florida, CRC Press, 37. Repolarisation Essay Single Ventricular Myocyte, Oxford Cardiac Pharmacology, available at: www.ocp.ltd.uk/ap1.html, June 2011. COR (Cellular Open Source), available at: http://cor.physiol.ox.ac.uk/, June 2011. Jordan P., Christini D., Cardiac Arrhythmia, Wiley Encyclopedia of Biomedical Engineering, 2006, DOI:10.1002/9780471740360. Clayton R. H., Computational models of normal and abnormal action potential propagation in cardiac tissue: linking experimental and clinical cardiology, Physiol. Meas., 2001; 22: R15–R34.